According to the SAIEE president, Dr Hendri Geldenhuys, an Engineering Excellence award is made to a member, senior member or fellow who excels in electrical engineering and who demonstrates above-average involvement in supporting the SAIEE with its aims and objectives. “Prof de Kock is a fellow, serves on various committees and also supports the SAIEE CPD programme by sharing his wealth of academic expertise. He has vast industrial experience in the design, commissioning, and performance assessment of generators and synchronous machines. His valuable contributions make him a deserving candidate for this award,” added Dr Geldenhuys. The SAIEE is a professional association with more than 6 000 members, and represents electrical and electronic engineers, technologists and technicians in Southern Africa. 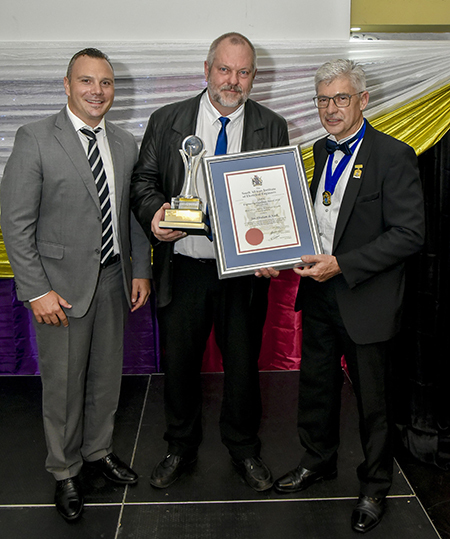 Prof Jan de Kock (middle) receives his award for Excellence in Engineering. Left is Francesco Pagin from Fluke who sponsors the award, with Dr Hendri Geldenhuys, SAIEE president, on the right.